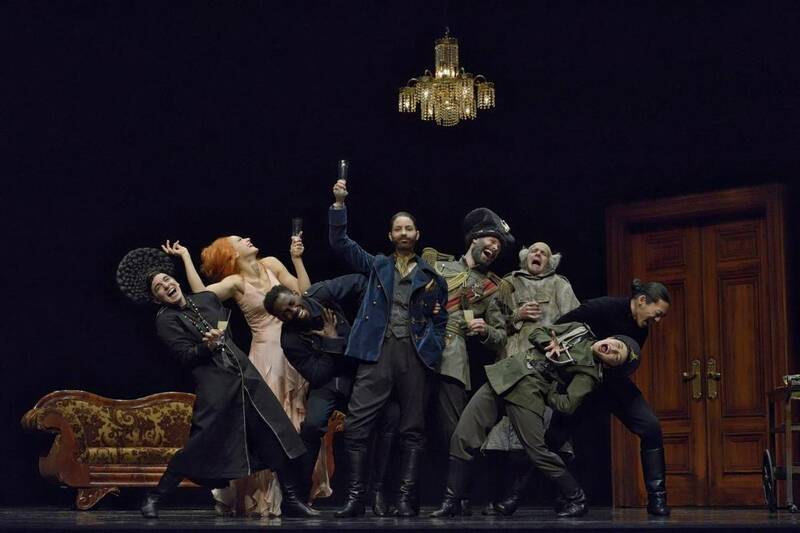 The first half has the dancers mouthing lines spoken by a voiceover as they animate the text, moving in exaggerated, cartoon-like forms-their mouths working overtime to form exaggerated expressions that could be seen in the back row. The premise of the story is set up; we’re introduced to the main characters including the leader, his mistress, his advisor, the postmaster, and many aides. The movement adds another layer of meaning onto the text that would not be possible in a traditional piece of theatre with more realistic gesture and straightforward presentation. While I could have watched the dancers act out the text for days, the second half is even more interesting and goes even deeper into exploring the way in which their movements brings the text to life. Without their character-defining costumes, they re-enact the events of the first half as their movements become more abstracted. The more the movements are abstracted, the limits of the ability of movement to tell the story are tested – how abstract can the movement become and still retain the meaning of the text? It’s a fascinating experiment in the relationship between meaning and movement. I was enthralled. In the end, the character-driven costumes return and the Postmaster (Jermaine Spivey) reads the Revisor’s final report. As he reads it, he flails and writhes, the contents of the letter too much for him to comprehend. As those around him say, “The Postmaster has ingested some kind of terrible news.” Spivey’s solo as he struggles to work through what he has just read is a stunning full-body expression of shock and betrayal. After the international success of Betroffenheit, Pite and Young’s latest collaboration was one of the most anticipated dance events of the year. It was wonderful to have the work premiere in Pite’s hometown — a special treat for Vancouverites to see this exceptional work before the rest of the country and the world.